Compact Disc released in 2001. This is an intact 2-on-1 reissue of the Columbia Lps Me and Juliet & Can-Can (1953) and Continental Holiday (1954). No theatrical season boasting musical comedies by Rodgers & Hammerstein and Cole Porter can be accused of lacking interest. Nor can a record by the two-piano team of Art Ferrante and Lou Teicher be open to the same accusation. The wit, the grace and the invention that is an integral part of scores by Porter or Rodgers is mirrored in the lively piano transcriptions of this remarkable duo. On this record, they offer highlights from two of Broadway’s most ingratiating scores, wherein the masters of musical comedy prove that their skill is as refreshing as ever. Any Rodgers-Hammerstein collaboration is full of promise, and in Me and Juliet, which opened May 28, 1953 and immediately proceeded to break records at the theater which previously had housed South Pacific, the promise was again fulfilled. Turning away from such distinguished adaptations as Oklahoma!, The King and I and the fabulous war-time romance, they provided an original musical comedy, as opposed to their previous ‘musical plays.’ Moreover, this show was about the theater, a highly public love of both Rodgers and Hammerstein, and their very real affection for their profession shone through in every scene. In moving from the more serious efforts towards conscious gaiety in plot and lyrics, Oscar Hammerstein II gave his collaborator a similar opportunity. An in Me and Juliet Richard Rodgers has created a score that has the lilt and sunniness of many of his earlier compositions written with the late Lorenz Hart. From the opening chords of Keep It Gay on this record the music is unmistakably Rodgers’, with characteristic melodic surprises in its lively tunes, and a surpassing quote of the deep, rich ballads that are his alone. In keeping with their tradition of never letting a good tune go to waste, one of the songs in the score is an adaptation of a theme Rodgers wrote for the television production “Victory At Sea.” This is the charming No Other Love, which forms the climax of the Ferrante and Teicher potpourri. Cole Porter’s long-time familiarity with Paris is sufficient assurance that his score for Can-Can has an authentic flavor of the city of lights. Countless trips to the city, and frequent residence there, have provided him with a feeling for the tempo and atmosphere of the town, even in a production dealing with a time that considerably ante-dates him. Music-hall Paris in the gas-lit era still survives as a strong tradition, however, and it is that tradition that he echoes in his music. The craftsmanship always evident in a Porter score is as sure as ever, and the fact that he writes his own lyrics gives his compositions a definite and personal kind of unity. For Can-Can he has created some of his most attractive numbers, each touched with Gallic flavor. Montmart’, the Can-Can and other lively tunes reflect the rowdy aspects of the period, while in such ballads as I Am In Love and the pretty waltz Allez-vous-en, he conjures up a special picture of romance. The Ferrante and Teicher arrangements, with their own references to French composers, underline the Parisian feeling of the Porter score, and provide a brisk survey of a memorably Broadway musical. On this record, Art Ferrante and Lou Teicher depart from their customary recorded style to provide fetching readings of musical comedy music. Heretofore on records they have been noted for an iconoclastic approach that treads along the edges of insanity. Using only two pianos and the marvels of magnetic tape, they have constructed a series of weird and wonderful sounds around some zany arrangements that have been as impolite to classic tunes as they were to popular songs. But as a change of pace, and to prove that they do respect composers, they play the songs on this record with immense charm and sensitivity, assisted by a rhythm group composed of Bunny Shawker on drums, Jack Lesberg on bass and Anthony Gottuso on guitar. Their dynamic work has been a staple of radio and concert repertoire for several years, and since 1947 they have been making regular cross-country concert tours with programs ranging from Bach to modern contemporaries. Two of the youngest students ever to be accepted at the Juilliard School of Music, they began together at the age of six, and soon combined their studies and ensemble teachers. After graduation, they joined the faculty of the school and began the experiments that led to their uninhibited and refreshing approach to recorded piano techniques; some of their innovations may be heard on this record. To some of Broadway’s newest and most delightful music, they bring an interpretation that is altogether right: right for the music, right for the listener. And in so doing, they provide many minutes of superior listening pleasure. In this light-hearted collection, those irrepressible pianos, Art Ferrante and Lou Teicher, conduct a skimming tour of Europe as represented by eight delightful melodies. Although swift, the tour is as graceful and charming as anyone could wish, and provides a pleasant incitement for those who have never made the grand tour, or a happy souvenir for those lucky ones who have. Beginning with The Continental, Ferrante and Teicher set up the mood with a bright, lithe selection from an early Rogers-Astaire film. Few songs written to introduce a new dance have the lift and merriment that this one does, and its excitement transports the listener abroad in a matter of moments. London is the first stop, evoked in a George and Ira Gershwin tune that conjures up A Foggy Day, wherein even the British Museum has lost its charm. This song, too, was introduced by Fred Astaire, and has since become a favorite standard. Moving cross-channel, The Netherlands is symbolized by an outstanding architectural feature, the Little Dutch Mill. The engaging tunefulness and simplicity of this song give way to a jolly salute to Wonderful Copenhagen, Denmark’s fascinating capital. Written by Frank Loesser for “Hans Christian Andersen,” the cheerful sweep of the waltz reflects the gaiety of one of the world’s most delightful cities. Skipping southward, Ferrante and Teicher next transport the listener to Austria, and Vienna Life, one of the most enduring of Strauss waltzes, and fill it with the magic implied in its title. A familiar Italian melody turns up next on the musical journey, to arouse vivid pictures of lights and music shimmering across the lovely Bay of Naples. Neapolitan Nights is the title, less familiar perhaps than the song itself. Next the dramatic colors and contrasts of the Iberian peninsula come to mind with Tango España, utilizing one of Spain’s most characteristic rhythms in an exciting piano-picture. As no trip to Europe could possibly be complete without a trip to Paris, Ferrante and Teicher conclude their tour in that magnificent city, with Jerome Kern’s The Last Time I Saw Paris, a tender and nostalgic souvenir of that endlessly enchanting spot. These charming piano settings, with their unexpected and felicitous ideas, are the rewarding products of one of the most inventive partnerships in music. Art Ferrante and Lou Teicher have brought some notable new sounds into two-piano renditions through decidedly unorthodox treatment of the keyboard, strings and the piano frame itself. In this collection, as in their other work, all the music—with the exception of those tones produced by the celesta—stems from the two pianos and those alone. Although here they have abstained from the hilarious madness that characterizes their brilliant single records, echoes of the technique can be heard in several of the numbers, used to point up and color the essential quality of the songs. 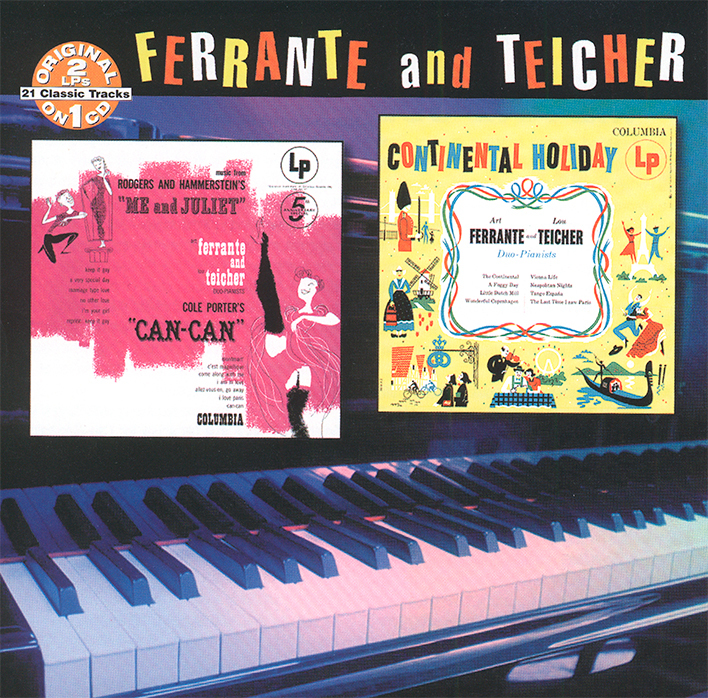 Long familiar to radio listeners, Ferrante and Teicher are also favorites of concert fans, whom they have delighted with recitals ranging from Bach to the composers of the present day in an annual series of cross-country tours. They have been playing together since they were six, and were two of the youngest students ever accepted at the Juilliard School of Music. Upon graduating, they joined the faculty of the school, and began their experiments in pianistic sound, coupled with the possibilities offered by magnetic tape recording. In Continental Holiday, they provide enlightening glimpses of both their classical background and their experimentation, together with a group of deftly-sketched musical pictures of Europe that reflect that continent’s charm and fascination.